100 AH Zero Turn Electric Riding Mower is rated 5.0 out of 5 by 4. Rated 5 out of 5 by GKatulka from WOW! This is my 2nd zero turn mower. My 1st is a gas-powered mower from a reliable, popular manufacturer. 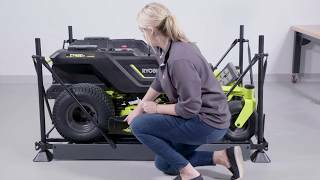 This electric Ryobi provides a much different experience from the other mower. The Ryobi has very good power and speed. The power is surprising. The Ryobi is very maneuverable and turns tighter than my other mower. The Ryobi drives better than my other mower - whether the mowing deck is engaged or not. The mower deck height is incredibly easy to adjust. The seat position also adjusts easily. The seat is comfortable and well-supported for bumpy terrain. This mower also has several features which stand out - namely the LED headlamps, USB port, 2 compartments for storage (with snap-back tops) and both low-speed drive and low-speed mow features for greater control in tight or challenging spots. This mower also features a rear-towing attachment. The battery life seems good as after 1 hour of operation, the remaining power was just above 50%. Most importantly, this mower cuts grass very well. The only features I would suggest for the Ryobi zero turn mower would be a roll bar and arm rests. When driving on uneven terrain, I tended to slide in the seat a bit to the left or right. Arm rests would probably add some stability for mowing on uneven yards. Overall, this has been an excellent experience. My other mower will be up for sale by end of this week. Rated 5 out of 5 by amiles from So easy to use. AND QUIET!!!! Bought my 75AH as soon as it came out. LOVE IT! Easy to operate and use, the low speed drive is a must for beginners to zero turn mowers. In high speed, this baby almost near flies! I went through some 6 inch grass in my back property that usually gives most mowers an issue, went through it like a hot knife through butter. I mow a little over an acre and it shows 60-65% left of battery, definitely believe it will do the rated 2.25 acres on a charge. Maintenance is non existent. Check the blades, tires, that's about it. No oil, gas, or belts to look at. No engine maintenance or tear down. Definitely recommend it if you are looking for a new mower for a first time owner or as a replacement for your old gas one. Now we wait and see how the durability holds up. Rated 5 out of 5 by herivaza from awesome easy and very comfortable to use. My neighbor recommend this product and she was right. The future of mowing has taken a turn. 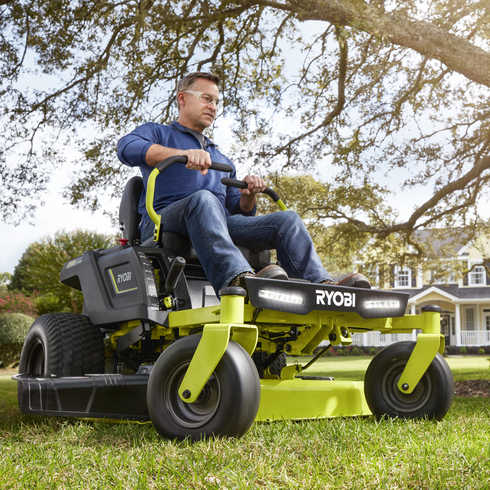 The RYOBI ZT480ex Electric Riding Mower uses zero turn technology with lap bar steering to help cover more yard in less time. Cutting up to 3 acres on 1 charge, it’s quietly and quickly changing the way America mows. A simple push of the lap bar steering delivers unrelenting torque directly to high-powered brushless motors. They quietly drive the wheels and blades, without the hassle of belts, spark plugs, gas and fumes. This feature-packed mower delivers extraordinary performance, convenience, comfort and durability. Surrender nothing but gas! Cutting Height: 1.5 - 4.5"